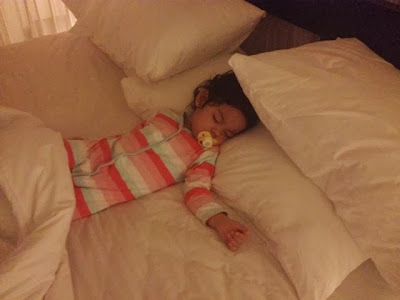 The tiny pink girl is Qarla! I went to Bali last month and I had such a great time.It was my first time going there and I haven't board a plane since I was..12 years old? ?It was a bit nerve wrecking during take off but with Razin sitting next to me,I was fine. 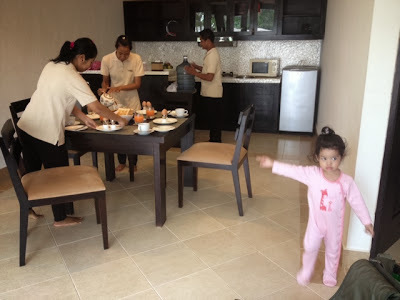 The Tukad Villa was chosen by Razin's sister,Nana via Agoda.It was the best place I've stayed on during a holiday next to Grand Lexis in Port Dickson(which I've stayed at twice in the past).We stayed there for 4 days and 3 nights. The place is a bit secluded in Seminyak but luckily for us,I had already booked us a driver from HERE,2 months before we left for Bali.So he knew how to get there and we didn't have to tell him the directions at all! 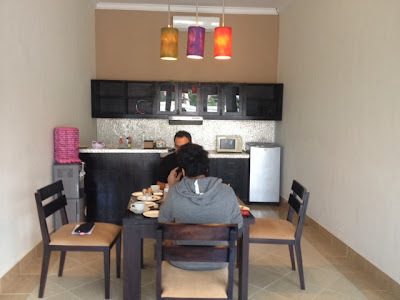 So if you're planning to stay here and want to go out to Kuta/Ubud etc(more on my upcoming blogposts),better hire a great driver.Our driver drove us to so many places.The first day we were out from 8.30 am-9.30pm! When you look at the pictures of the villa on Agoda or the website itself,you're actually seeing the actual pictures.It wasn't doctored or photoshopped in anyway like when you see some hotel pictures etc. 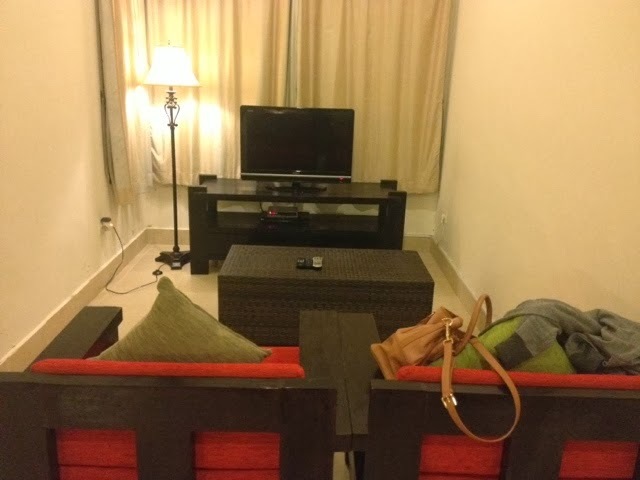 That was what blew my mind when I reach the villa at midnight(our flight from KL was at 8.25pm),it was just so beautiful and worth every penny spent.It was so huge! 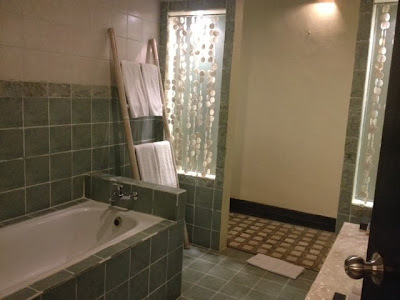 We chose a two bedroom villa.Each bedroom had a living area with a flat screen tv which had various tv channels.There was a big canopy bed(with mosquito netting..thank god),a rain shower and also a huge bathtub. There was also a huge pool,a beautiful raised hut and a garden.We had a dining table and a kitchen with a fridge,stove and a well stocked cabinet and a water dispenser--hot,cold and fresh water. 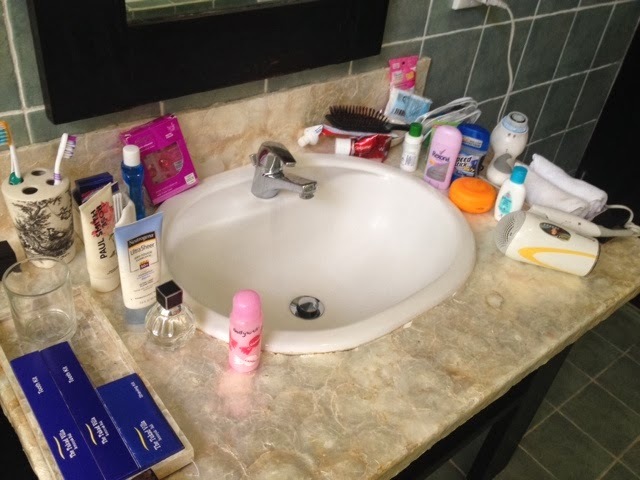 Suffice to say that the villa was just very well equipped so that their guests will have a perfectly comfortable stay there.There was a safe box in each room,a hair dryer,bathrobes,slippers and there was full size bottles of shampoo,body wash and conditioner as well along with the normal things like shower cap,sewing kit,shaver & etc. Breakfast was sent to our villa every morning.The pool was cleaned every morning as well.Our bedroom was cleaned everytime we go out--sometimes twice in a day. I would definitely love to stay at the villa again with my family or friends.The staff just really take care of you despite there was less than 6 staffs there if I'm not mistaken. Laundry was cheap as well(in comparison to hotels in Malaysia).I send my dress for cleaning and it was only 6000idr(around rm1.80) and also had facial at the villa--it was around 122500 idr.But do take note that they've a 21% tax on anything there. Overall,the five of us had such a great stay at The Tukad Villa during our 4 days in Bali.Great villa and service.I definitely recommend the place for those who wants to stay longer in Bali or travelling with family members as it is very very comfortable and spacious.